At the heart of this panoramic, multidimensional narrative is the compelling struggle of a young woman to lift her body and soul out of the gutter. Faber leads us back to 1870s London, where Sugar, a nineteen-year-old whore in the brothel of the terrifying Mrs. Castaway, yearns for escape to a better life. Her ascent through the strata of Victorian society offers us intimacy with a host of lovable, maddening, unforgettable characters. They begin with William Rackham, an egotistical perfume magnate whose ambition is fueled by his lust for Sugar, and whose patronage brings her into proximity to his extended family and milieu: his unhinged, childlike wife, Agnes, who manages to overcome her chronic hysteria to make her appearances during “the Season”; his mysteriously hidden-away daughter, Sophie, left to the care of minions; his pious brother, Henry, foiled in his devotional calling by a persistently less-than-chaste love for the Widow Fox, whose efforts on behalf of The Rescue Society lead Henry into ever-more disturbing confrontations with flesh; all this overseen by assorted preening socialites, drunken journalists, untrustworthy servants, vile guttersnipes, and whores of all stripes and persuasions. 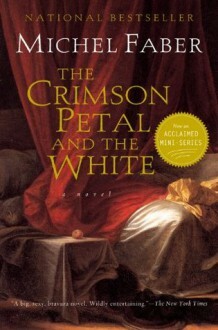 Twenty years in its conception, research, and writing, The Crimson Petal and the White is teeming with life, rich in texture and incident, with characters breathtakingly real. In a class by itself, it's a big, juicy, must-read of a novel that will delight, enthrall, provoke, and entertain young and old, male and female.